Efficient non scratch scourer pad. Recommended by Tefal. For use on delicate surfaces. Easy to rinse. Long lasting. 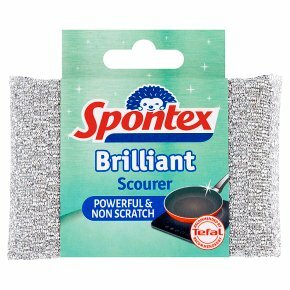 Spontex Brilliant Scourer pad effectively removes stubborn burnt on stains from pots and pans without scratching. It is recommended by Tefal, the experts in non-stick, to clean delicate surfaces without damaging them. Made with supple fibres and coated with aluminium, it is very easy to rinse and long lasting too! Simply brilliant! Scourer pad size: 13 x 8.5cm. Warning: For use on very delicate surfaces test on an inconspicuous spot beforehand.